Having spent twenty months in SE Asia we have decided its a great place to hang out. The Andaman Sea coastline from Langkawi in Malaysia to the Myanmar (Burmese) border of Thailand has endless cruising opportunities amongst a plethora of islands which in the north have good underwater visibility and an abundant marine life. In the off season, when the SW monsoons blow the area has excellent air connections into Indo-China and the rest of Asia. We left our base at a marina on the tiny island of Rebak, off the shores of Langkawi island on Dec 4th '08 on a short passage to Telaga to formally check-out of Malaysia and work out what sailing a boat was all about after eight months off. Ten days and five islands later we checked into Phuket, Thailand which we had got to know quite well during last season's cruising. This was our base for the festive season again which we enjoyed with a host of sailing friends that we had made crossing three oceans. This is Christmas day's pre-luncheon drinks on Amoenitas. There are folks from Canada, New Zealand and the UK, bit of a Commonwealth ghetto. Apologies for the distortion, the cockpit isn't so large, its just that the camera had a 10mm focal length, wide angle lens. The sad thing about this season of year here is that it is the time to leave for the Red Sea and passage back to Europe via the Suez Canal. So there are many emotional farewells. From the group in the picture we will sadly miss Keith (far right) and Carol (just to Di's left) from Kirsten Jayne, with whom we have shared many an experiences and had lots of fun with spanning 28,000nm. 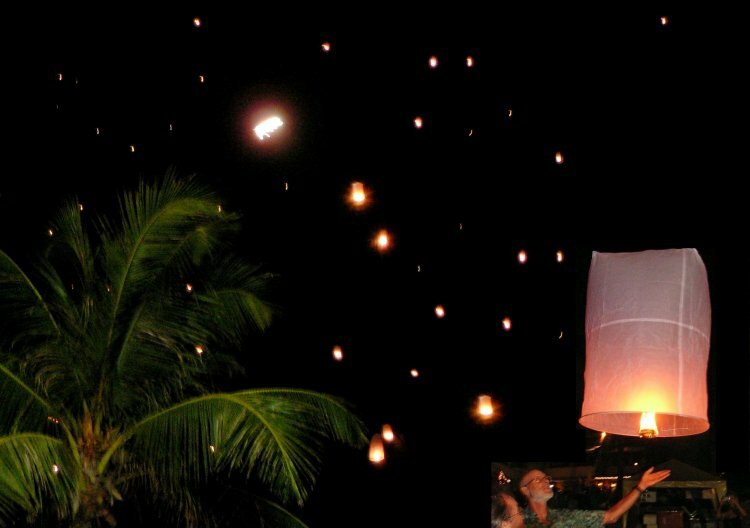 Another moment of reflection comes after dark at Patong on New Year's Eve when thousands of hot-air lanterns are launched, reputedly one for each of the lives lost in the 2004 tsunami. Inset is one we launched last year for near neighbours Bob & Sue from Canada Road Wellow who lost their lives just north of Phuket. Patong is a dreadful tourist ridden bay on the west coast of Phuket Island, good as far as we are concerned for one thing only, a great New Year's Eve firework experience. Naturally we left early next morning on the 150nm trek north up the coast to the group of islands just offshore from Ranong, the Thai border town adjacent to Myanmar. On the way we called in at a number of islands, bays and estuaries including the resort of Khao Lak where neighbours Bob & Sue had been staying. On that fated Boxing Day morning of 2004 the Police patrol vessel Buretpadungkit had been anchored about 1nm offshore on protection duty for Her Royal Highness Ubonrat Rajakanya Siriwaddhana Phannawadi, her son and daughters (remembering names of locals can be challenging). The waves carried the 80 foot vessel 1.8Km inshore where she remains as part of a memorial to the 5395 people who lost their lives in Thailand. We saw documentation which claimed the overall fatalities totaled 229,866, of which 167,736 were from Indonesia. 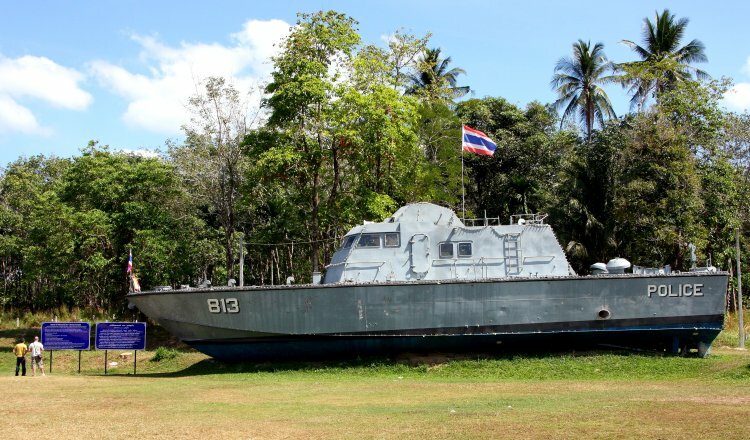 Police patrol vessel 813 was washed 1.8Km inshore by the tsunami on Dec 26th 2004. Here's a fine picture of Amoenitas doing what she does best, beating to windward in a steady 15kts from the NE. This trip up the Thai west coast is almost due north so its hard on the wind all the way, except in the all too common light airs when its a motoring job. As avowed conservationists, we hate having the engine on. Thanks for this image go to Alfred on Iron Horse who we were in company with. We rarely get good photos of us underway. We called at many interesting anchorages on our way north and had some good sailing conditions for a change. 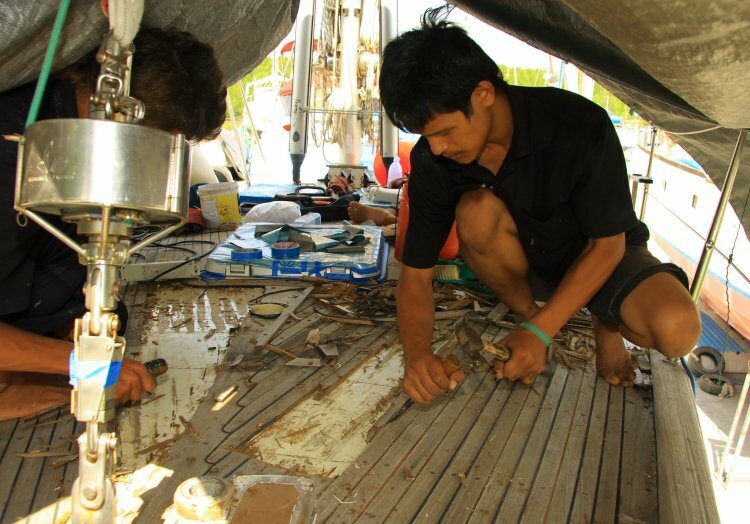 The winds last year were much lighter but this time we cracked on day after day until by the time we reached Koh Phayam, our most northerly island, we were glad of good sheltered anchorages. Phayam was a fascinating island about 5 x 3nm with two deeply indented bays on the west side. It had a Shangri-La atmosphere of laid-back, friendly visitors, mainly in backpacker type accommodation and lots of beachside restaurants catering for every taste and pocket. There are no cars, just motor cycles galore and some good walking routes. Our first excursion northwards took us to the main habitation which boasted two piers. One for docking vessels, the other sporting an extravagant looking but poorly constructed concrete Buddhist temple with inside this varied collection of figures. The bays of Koh Phayam are wide, with magnificent expanses of pure white sand at low water. On the 1.4nm long SW facing bay that sand is of the finest particle size we have ever come across, such that it squeaks as you walk over it. Its probably such pure silicon you could make transistors from it using a Bunsen burner. We also met 'interesting' people there such as the hippy of our era, an ex-Harrowvian (expensive English public school) who had taken refuge there with a Burmese lady following the Lloyd's collapse of the 80's when 'Names' lost all but what they were standing up in. Of the two tracks traversing the island N/S we preferred the easterly one which was unpaved, the other was concrete about 1.5m wide which was intact for about 60% of the way. Along the route we passed through small subsistence holdings interspersed with the odd rubber plantation. 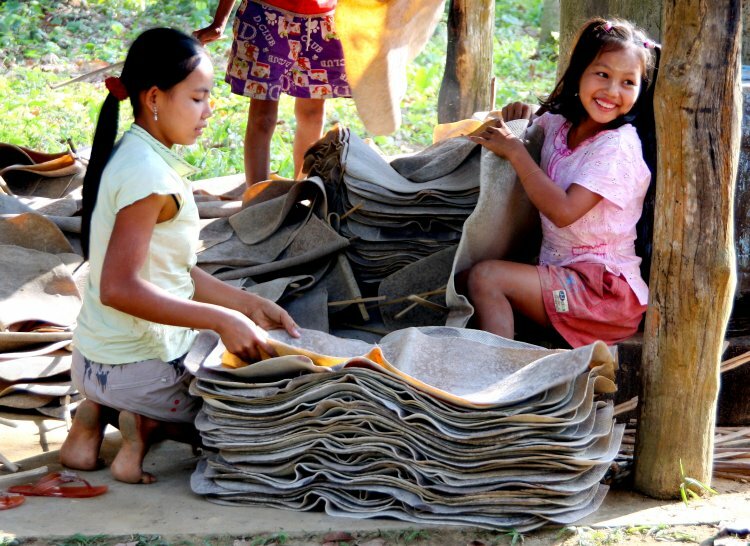 Here the girls of this family run holding are checking and stacking the pure latex that after treatment by acid has been put through a roller and hung out to dry. 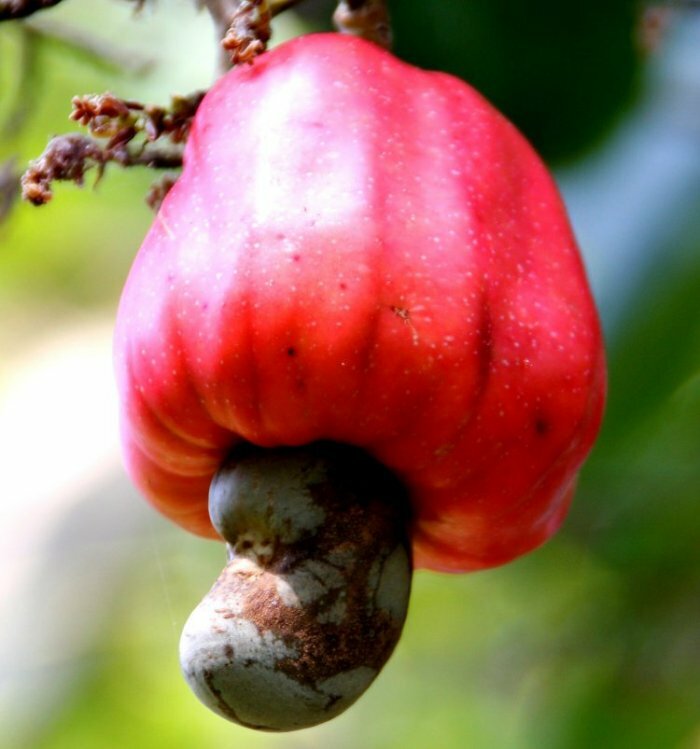 The other commercially important crop on the island are cashew nuts but how many of you know what they look like on the branch? The nut casing gives every appearance of having been attached to the bottom of the fruit with glue. The apple like fruit is juicy and not unlike its namesake in taste. Our first experience of these nuts was on the remote north coast of Trinidad in 2001 when we anchored in quiet bay and found some growing wild on a hillside. Returning to the boat with a handful, Dave was musing on why his fingers were beginning to swell. The nut cases are quite toxic and are normally boiled before being dried and cracked open using gloves. On Phayam its a job for anyone who has time to spare and is in need of the cash. They are paid by the Kg of complete nuts which is tough as the casing is hard and extracting the nut whole is quite an art. After around a week enjoying Koh Phayam, including taking the ferry into Ranong to visit the renowned market of the frontier town, we reluctantly headed the 42nm SW to the Surin Isles. That was a directly downwind trip with up to 30+kts over the deck in rough seas but as a reward we found a sheltered anchorage in very much clearer waters with a good snorkeling reef nearby. 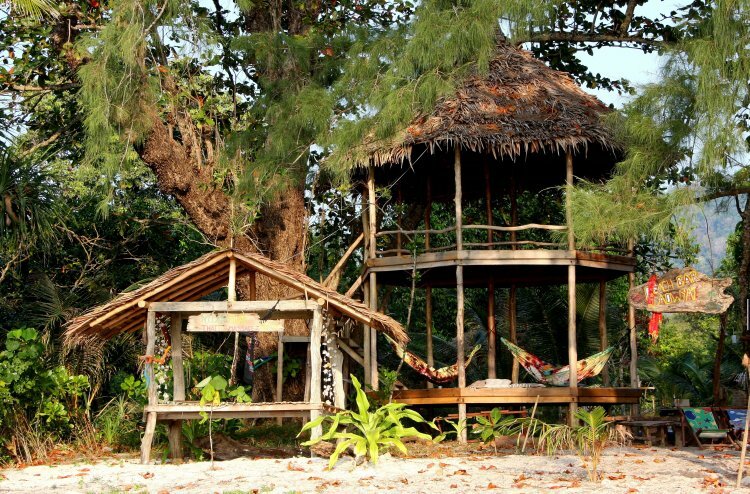 The two Surin Islands are almost the most southerly home of the Chao Lay, or Sea Gypsies. They are nomadic seafarers who roam the SE Indian Ocean, mainly concentrated in the many small islands off the coast of Myanmar. This branch in Thailand are called Moken based on 'oken' the word for sea water. They exist on fish and sea shells based on their small craft from December to April but move ashore to improvised beach shelters in the stormy monsoon season. A nomadic Moken family in their tiny floating home. We also shared the waters of the Surin Islands with a varied collection of local fishing craft from modest open longtails to this one of more traditional design. 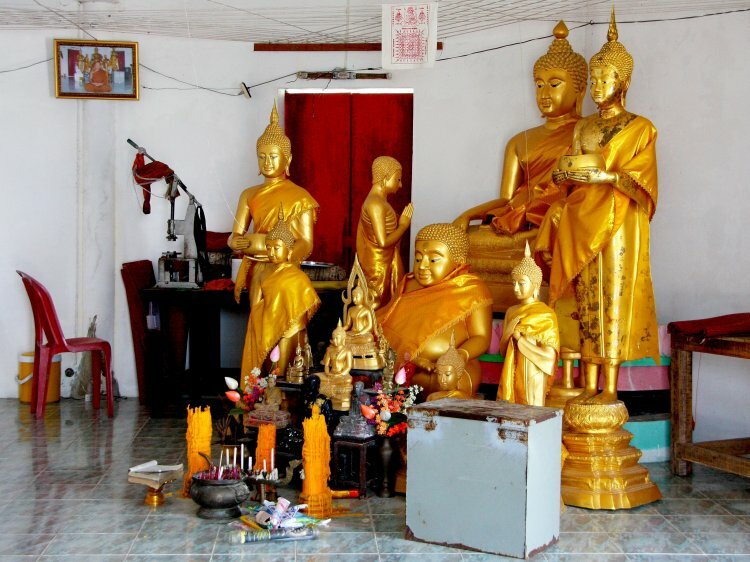 However, it is unusual in that it is painted drab grey (apart from the rusty fastening stains) and has no embellished name written in flowing Thai characters. In fact it looks just like the boats from Myanmar (Burma) their northerly neighbour. but can be distinguished by the Thai flag camoeflaged amongst the inevitable washing. As is typical, it has a large crew of very young matelots, hence the need for the two large light green water tanks lashed together on the after deck. In the continuing, unusually long spell of strong NE winds we found four sheltered anchorages around the Surins from which we could explore, two of which had good snorkeling reefs nearby. 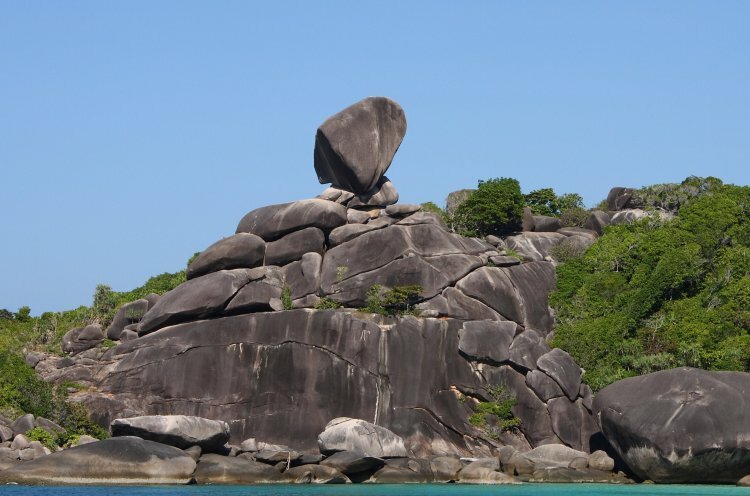 The winds at last looked as they were moderating so it was time to make use of the last of them for the 50nm passage south to the Similans, another group of nine substantive granite islands. The name is derived from the Thai word for nine so you locate yourself with just the number incremented from south to north. These are a charming group set in crystal clear waters with many good anchorages in the NE season but few places to shelter in the SW monsoons when the islands are deserted. Joined by friends Alfred & Rosemarie on Iron Horse we immediately made the transition into marine mode, the men diving whilst the girls kept cover in a tender as swift currents can arise suddenly around the headlands. After the dive we would get in at least one snorkeling trip for all four of us. Our second mooring was in the large Donald Duck Bay which has a National Parks base with an unusually good but basic restaurant for visitors who use the tented accommodation provided. The short climb up to the distinctive rock is only made possible by numerous improvised ropes, ladders and bridges constructed by the Parks Dept. They have also marked out a nature trail that traverses the island along its ridge for about 3km through the dense, granite outcrop strewn rain forest to an impressive south facing viewpoint. 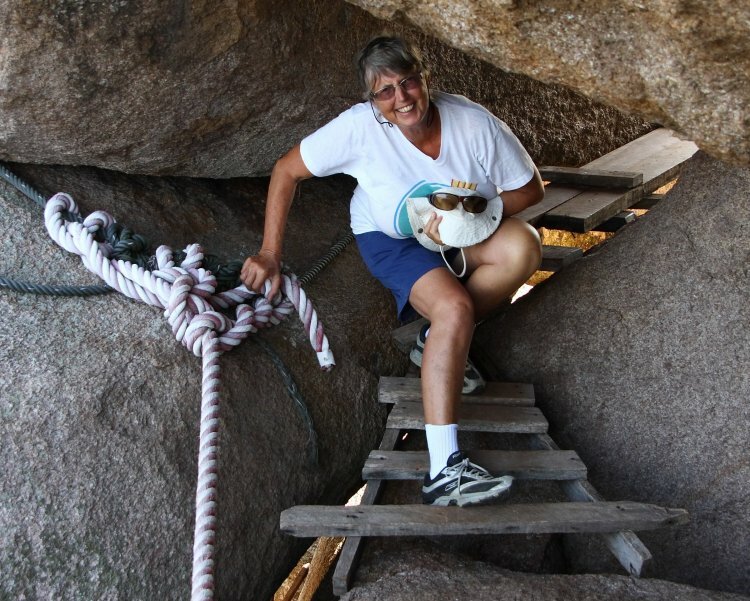 Here's Di negotiating her way through crevices to Donald Duck Rock. 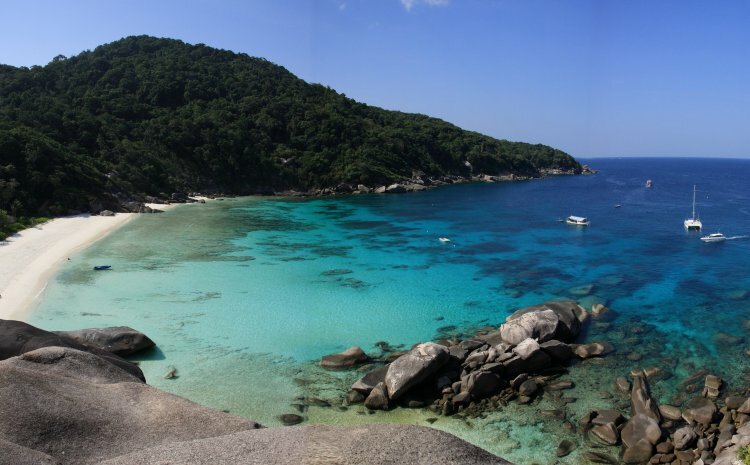 From the rock there is a splendid view across the bay that illustrates just how clear the waters of the Similans are. At this time of year the islands are a popular destination for three distinct groups, cruising yachtsmen, scuba divers on large dive boats and backpacker tourists who stay in one of the two large tented sites run by the National Park. This year Alfred and Dave dived most of the well known sites and given our experience whilst circumnavigating can pronounce without fear of contradiction that this is one of the major world class diving venues. For further evidence see the page Marine #6 of this web site reached through the link to 'Earlier Updates', 'Marine Life' and 'Latest news'. Our five week cruise to northern waters was brought to an abrupt end by the need to return to Phuket to prepare for the haul-out and to renew our visas. The latter are a significant inconvenience for the longer stay visitor to Thailand. We get a 'three month' visa from a Thai Consulate abroad before we go but that is only good for two months before you have to cross the palms with silver to activate the third month. After that you normally have to leave the country to re-visa or do a day trip to a nearby Myanmar or Malaysian town without a consulate that will get you a further 15 days only. We have now set up a Thai bank account so in future will have a further option of getting a retirement visa. However, having built some slack into our planning before our appointment with the travel lift, we had a week in which join up with old cruising friends Malc & Lindy on Mr Bean to explore the SE side of Phang Nga Bay which extends down the mainland to the east of Phuket Island. It is a picturesque area formed from towering karst limestone rocks and enjoyable provided you are tolerant of hordes of other tourists and the exceedingly noisy longtail boats that they are ferried about in. The island below is one of two that meet in a long sand bar, just exposed at low water with an excellent anchorage to the west. This picture of Koh Dam Khwan was taken on our approach from the SE where the prominent rock on the right looks less like the chicken head from which its local nickname is derived. If you have deduced that the two power boats in the foreground look somewhat similar, you are quite correct. It is an electronically 'stitched' image where Dave took the RHS first so that the boat appears twice (see the way the boats wake suddenly disappears at the join point).. Looking across to the west from the sand bar anchorage we enjoyed some superb sunsets. 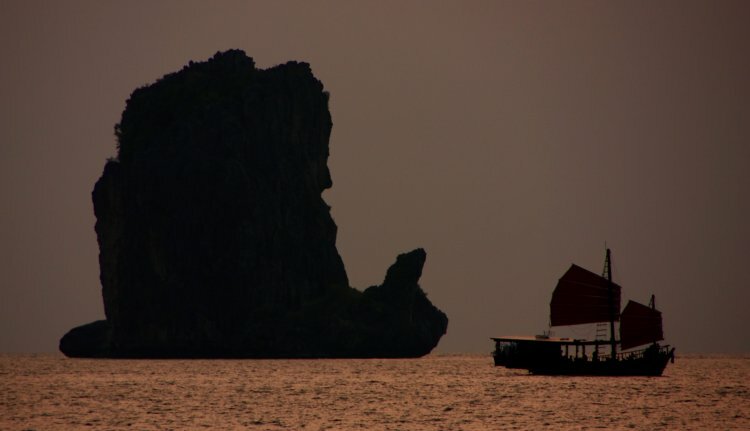 We have a good one for you later so will show here this more atmospheric scene of a tourist junk-like vessel crossing in front of a karst pinnacle with Freudian overtones. Sorry about that! A few miles to the east of these islands are a group of mainland bays that are close to the town of Krabi which has an international airport, so are popular tourist haunts. In the picture below you gain an impression of the dramatic cliffs with their huge stalactites and the isolated beach between. It appears as though we are anchored a long way offshore which is an artifact of two pictures taken with a very wide angle zoom lens set at 12mm and again stitched. Sailing buffs will have noticed that the port genoa and staysail sheets are missing, removed electronically as they didn't join correctly in what is a very extreme test of the art of stitching. The lesson being, never believe anything you see in a picture, especially Dave's! This next picture is however the real thing. There is a cave at the eastern end of Tham Phra Nang Bay containing a shrine dedicated to .......well look for yourself. Its pretty indicative of the Thai attitude to all matters sexual. Everything related to it is much more open, from the ugly, over large Aussie and European men sporting sleek Thai partners to a somewhat ambiguous attitude to gender. Like images, never take a young Thai belle at face value, it could turn out to be a 'Ladyboy'! This whole coastal area extending some 350km from the Thai border with Malaysia to 50km north of Phuket is home to dramatic, towering, karst limestone edifices. Phang Nga Bay at the north of the Gulf of Phuket is probably the most famous but all along the coast as well as inland are these structures, often long but very narrow, rising almost vertically to over 250m from the sea or out of flat plains. 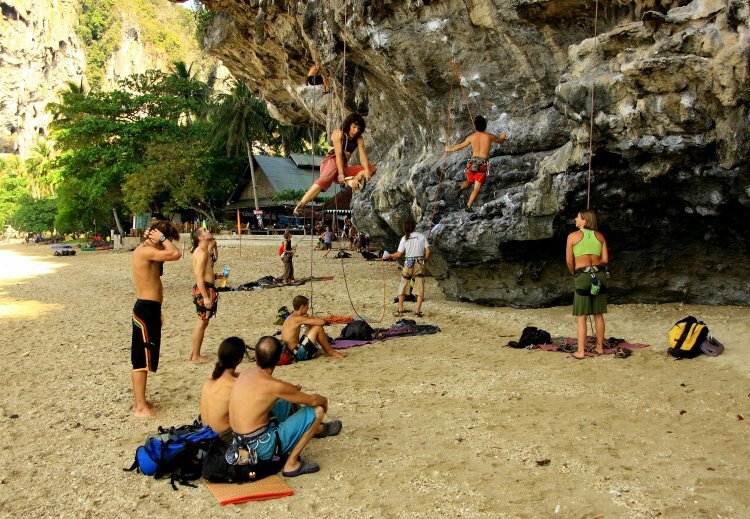 Rai Lei near Krabi is a mecca for the extreme climbing brigade who gather on the beach to take it in turns on some challenging pitches. This is not a purely male preserve as we saw almost as many very fit ladies on the faces. 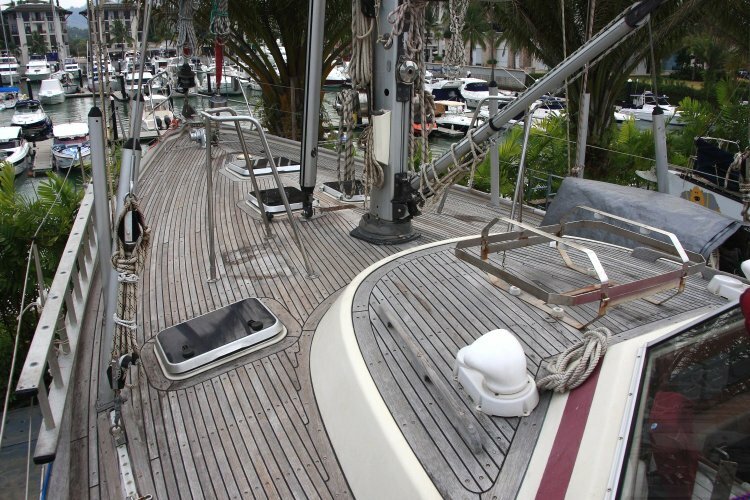 On 12th Feb we reluctantly cast aside cruising to haul out at the Royal Phuket Marina to have Amoenitas's teak decks replaced. Though that job only took around six weeks we were ten weeks in all on the hard at the RHS of the picture below, about where the boat with the blue cover was. Fortunately we occupied an elevated position so could catch any passing breeze. With day time temperatures between 32-34C and the nights not much cooler it must have been pretty uncomfortable in the airless marina below us. We stayed aboard to be close to the work but sadly devalued our reputations to a paler shade of Green by reluctantly acquiring air conditioning for use at night time only. Soon after we acquired Amoenitas in 1997 the plugs over the screws holding down the decks started to 'disappear'. We knew the effect was just cosmetic and that replacing them was impractical but it did detract from what is one of the many charms of a cruising boat from this Scandinavian boat builder. After twelve years it was looking pretty sad but at least we are in probably the best place in the world to get the job done. Gig and his team of four set about the task with incredible dedication, given the nature of the job and the climatic conditions. Here they are removing the old planks one by one with chisels. We were not inactive whilst this was going on as Dave had the mammoth task of removing and renovating all the through-deck mounted equipment on the boat. 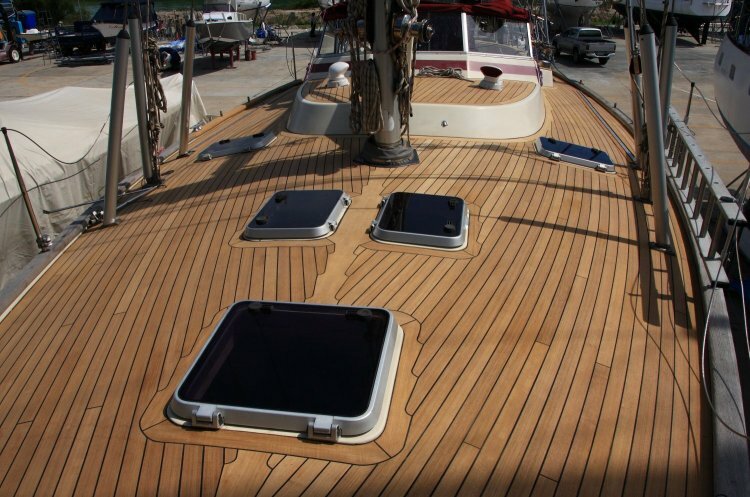 For example, the four metre long genoa tracks were held in place by 34 bolts each which had to be accessed by taking the head lining out of all the cupboards, wardrobes, cockpit locker, etc. Not only does this cause chaos below but introduces enormous quantities of dust and dirt into every aspect of daily life. Not only is Phuket home to some extremely talented carpenters but they also have access to some superb timbers. Our decks were clad in quarter sawn, kiln dried teak from a noted source near Ayutthaya around 80km north of Bangkok. Look, not a screw hole in sight either! Smart as these pristine, virgin decks looked, there was little time to admire them as all the gear had to be put back on again. Because of the excellent build standard Amoenitas was constructed to, it was generally not too difficult to extract and replace equipment. There was however one glaring exception. The Lofrans Leopard electric windlass that hauls and lowers our main anchor was well and truly glued together by corrosion. We'd like a few moments with the Italian designer who specified stainless steel shafts through alloy bosses. It took two weeks of lots of people trying, not all day but at least a couple of hours every day to remove it. Both the top plate above deck and the gearbox below were inextricably attached to the vertical shaft. 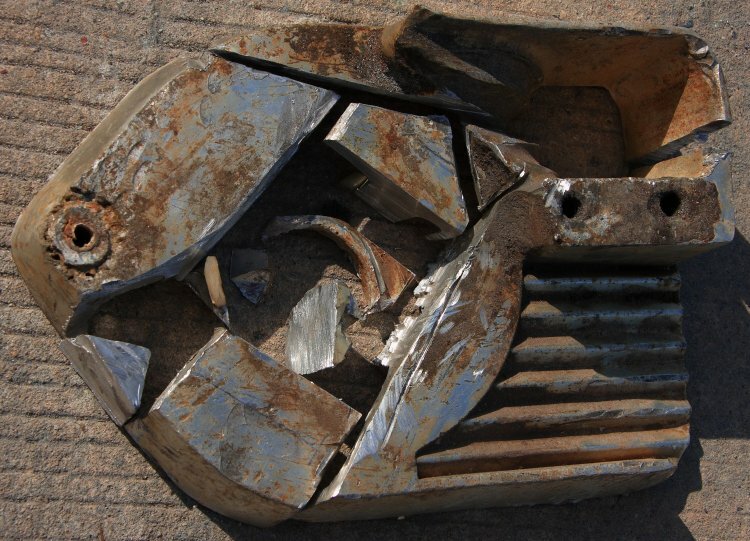 Eventually it was in danger of holding up the deck replacement so Dave subjected it to hacksaw and angle grinder attack with the result below. Thanks to cruising friends who had some old spares we managed to rebuild the whole thing right down to replacing the gearbox bearings. Getting the electric anchor windlass off the foredeck was achieved with consummate care! By 27th April we were all ready for the water and below is a much spruced-up Amoenitas ready for the launch. As often happens with boats, you tend to get carried away and one job leads to another. We had all the cushions re-upholstered, light fittings polished and varnished, galley Formica replaced, hull and coach roof stripes re-sprayed, chain re-galvanised, etc, etc, etc. In the midst of all this activity we had to cope with a tragic event when one of our close cruising friends was murdered by three swim aboard, Myanmar, illegal immigrants. For us it began in the late afternoon of a very wet 24th Feb when one of the marina staff knocked on the hull with a message to ring this number urgently. It turned out to be the Honourary British Consul for Phuket who had been charged by the embassy in Bangkok with finding Dave & Di on Amoenitas in Phuket. Lindy, Malc's wife had given our names to the embassy along with the family in UK's details. We managed to contact her shortly after she got to hospital near Satun and immediately hired a car for the 7hr drive to be with her whilst the family were on the way from Sussex. It was a traumatic period of disbelief, compounded by the fact that having thrown Malc over the side, there was no body for around a week until it was found by fishermen. We returned to Lan Gu near Satun a week later to accompany Lindy and four 'children' to a memorial service at Rebak Marina off Langkawi, just over the border in Malaysia. Dave then sailed Mr Bean back up to Phuket where 'she' is being sorted out ready for sale. We have been close friends of the 'Beanos' since we first met at the island of Tortuga off the Venezuelan coast in 2001. Mr Bean and Amoenitas went through the locks of the Panama Canal lashed together in March 2002. 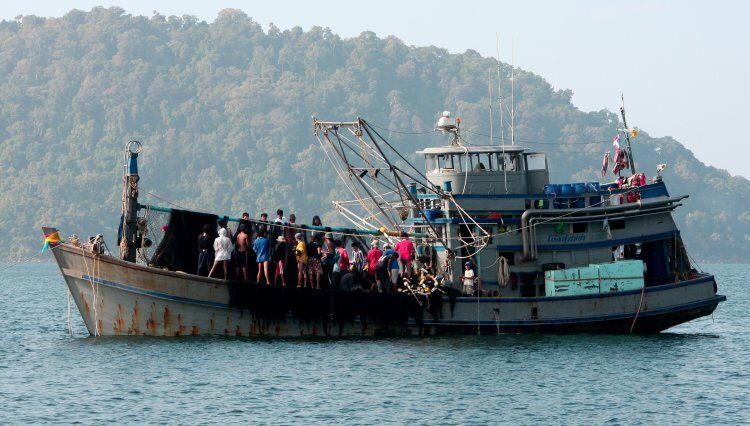 We had been cruising together near Krabi just before we hauled out in February which has all made it very difficult to come to terms with what was such a pointless and unnecessary loss. 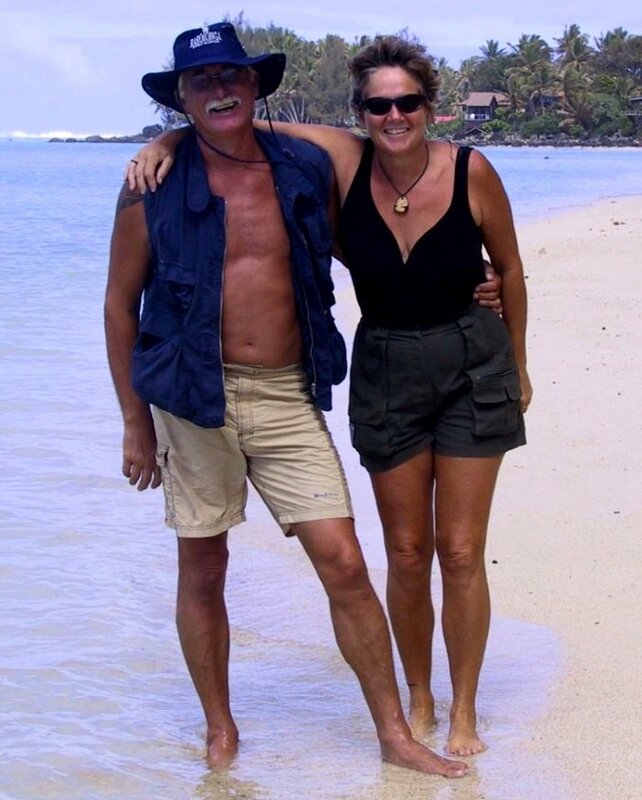 Here's a picture of them taken nearly seven years ago in the Cook Islands of the South Pacific. We have to finish on a happier note, so here's Di wading out to 'Yellow Peril', our inflatable canoe after a memorable BBQ on a deserted island off the northern Thai coast with friends Alfred & Rosemary of Iron Horse. 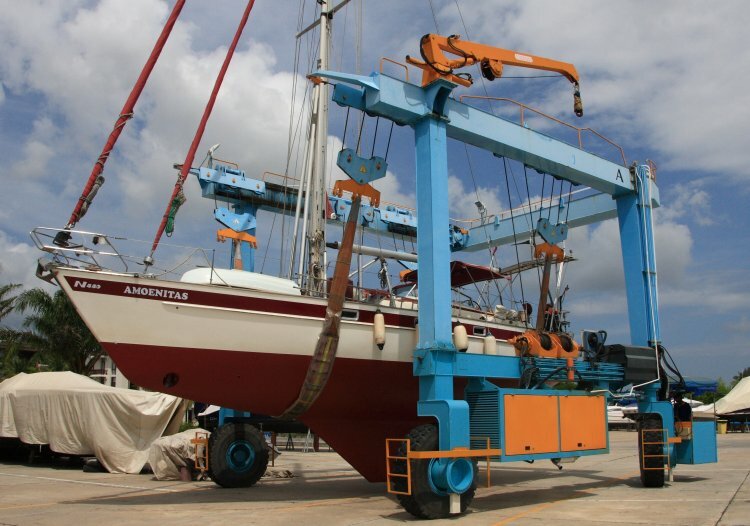 Amoenitas is now back at Rebak Marina, off Langkawi in Malaysia where we are preparing her for the SW monsoon, off-season. On 6th June we will fly back to England for 12 weeks where we are looking forward to seeing all our family and many friends again. Paul & Emma have a new daughter, Chloe Diana Gail, to introduce to us. She is the first female to join the Dave & Di line after our two sons and three grandsons. Nanna Di is delighted. We also have to do some serious decoration of our home in the New Forest after ten years with tenants and precious little refurbishment internally. We'll return to Rebak for one week only at the end of August before setting out on 7th Sept for some serious Asian land touring with a couple of Kiwi cruising friends. Beginning in Beijing we'll explore China, Tibet and Nepal. There'll be a number of high points en route, firstly the 47hr trip over the roof of the world on the new railway from Chengdu to Lhasa in Tibet (average height 4,000m). Eventually we will spend two nights at the Everest Base Camp on the Tibetan side before making our way into Nepal. The plan there is to trek along the Annapurna trail. Life in this part of the globe being as easy and appealing as it is, we still have not managed to generate any enthusiasm for returning to Europe. Lets face it, the economic gloom, not to mention the unsettled state of the seaways off Somalia makes staying on here an even more attractive prospect. The plan at the moment, in so much as we have one (we pride ourselves in only having one plan ; that is not to have one) is to spend the '09/10 festive season around Phuket again, do some diving, then head south in March to prepare to head down the Malacca Strait to Singapore, then on to the north coast of Borneo.